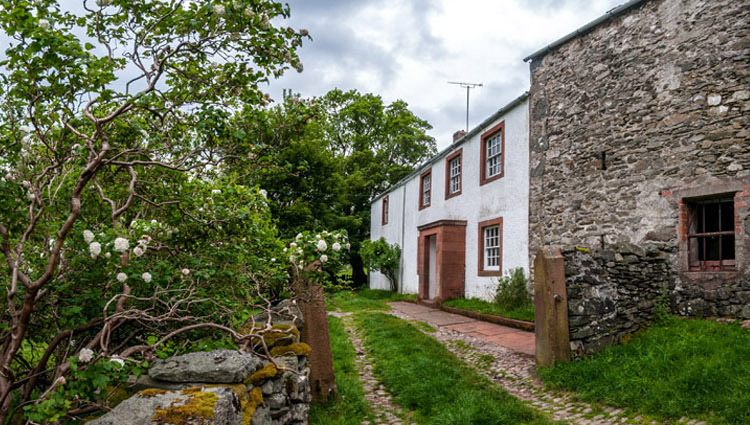 Bonscale Farmhouse: Swarthbeck Farm Holiday Cottages on the shore of Ullswater in the center of the Lake District, Howtown, Penrith, Cumbria. CA10 2ND. Bonscale Farmhouse sleeps 12 people. A lovely old farmhouse with spectacular views across the lake and up to the Helvellyn range. Six bedrooms and two staircases allows for large family or group holidays. There is a games room with table tennis, and downstairs utility and shower room. Bonscale is set in the midst of open farmland with direct access to the fell. There is plenty of parking space. There are a total of six bedrooms and two bathrooms upstairs, reached by two separate staircases. The main wing has one double, three twins and a bathroom, and the other a large twin, small bunk room and bathroom. Heating is by electric night storage heaters. Hot water is by immersion heater powered by off peak electricity (with booster as required). Downstairs accommodation consists of kitchen, sitting room, dining room, larder, games room with table tennis and utility room with shower and WC.